New research released today as part of National Medication Adherence Week (3rd to 9th July 2017) finds 93% of pharmacists and their staff believe patients don’t understand the impact of medication non-adherence. The research also found patients were often too preoccupied when collecting or ordering their prescriptions. 77% of pharmacy staff believe that patients are often distracted by their mobile phone. An equal number felt that patients were distracted by children and 60% felt that parking restrictions were to blame. All factors contributed to preventing patients from listening to crucial information regarding dosage and the impact of adherence on long-term health outcomes. Shockingly, 93% of pharmacy staff feel that media scare stories about drugs and side-affects (such as statins) impact adherence rates with patients. Non-adherence to medication is a major health issue facing the UK. The cost to the NHS of people not taking their medicines properly and not getting the full benefits to their health is estimated at more than £500 million a year, with a further cost of £300m on wasted medication. But the consequences are not just financial and go far beyond what most patients envisage when they forget to take their pills. In the EU alone, nearly 200,000 deaths occur each year due to missed doses of medication taken incorrectly. Throughout July, Omnicell UK and Rowlands Pharmacy are launching ‘Let’s Take Care of It’ campaign in National Medication Adherence Week (3rd to 9th July 2017) to help address the issue. The campaign will be supported in 500 Rowlands Pharmacies with specially produced educational leaflets and display posters for both patients and carers. 75% of pharmacy staff felt that both GPs and pharmacists should be involved in patient conversations about adherence to medication. Paul O’Hanlon, Managing Director of Omnicell UK comments; “All major chronic illnesses require effective adherence and medication management. Without this people won’t get better and at worse their health may even deteriorate. Whilst the reasons for non-adherence amongst patients are varied, none are insurmountable. This includes easy to use weekly pill packs which contain all medication packed into individual blisters for different days and times of the week, so patients know what to take, and when to take it. 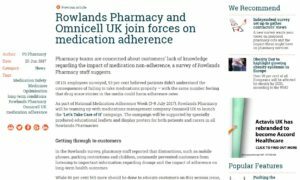 “We are delighted to be partnering with Rowlands to raise awareness of the issue and would welcome the opportunity of working with other pharmacies to replicate this best practice and help instigate real change across the healthcare community.